The Kambly round trip connects Switzerland’s capital Bern to Lucerne on the shores of Lake Lucerne and Interlaken. A visit to the Kambly Experience, a show confectionary in Trubschachen, is one of the highlights of this trip. During one single day, visitors experience magnificent views of snow-covered summits and travel along deep blue, pristine lakes, lush green meadows and picturesque farms. All those highlights are linked together on a scenic train ride rich in variety. On the Luzern–Interlaken Express of the Zentralbahn, guests enjoy a ride over Brünig pass, travel along five lakes and pass by a multitude of waterfalls and characteristic, quaint Swiss villages. 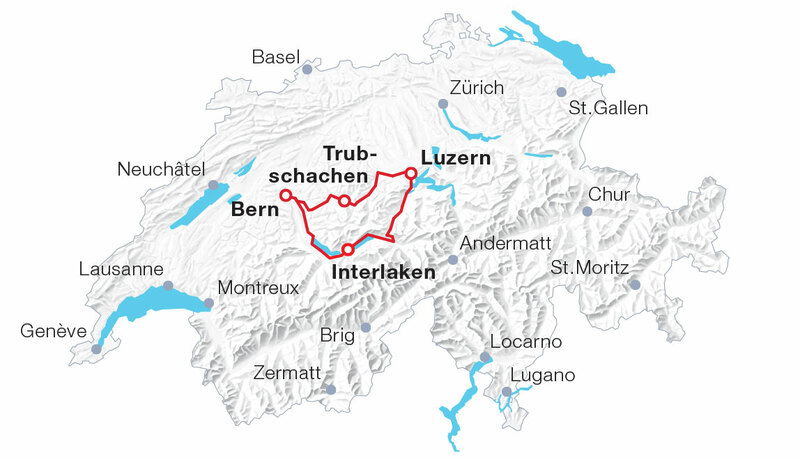 The BLS Regional Express connects Berne and Lucerne, traversing the typical, rolling landscape of Emmental and passing the UNESCO biosphere Entlebuch. At the heart of idyllic Emmental, the train stops right in front of the Kambly Experience, where secrets of the art of pastry making are revealed. No catering facilities on the train. The round trip can be started at every stage along the route in either direction.